3 step system seals and protects steel tanks. 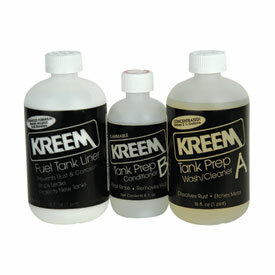 Comes with Prep A (wash/cleaner), Prep B (conditioner) and the fuel tank liner. Prevents rust and corrosion, stops minor leaks and protects fuel from contamination. Treats one, three gallon steel tank. This stuff works great! I’ve fixed several old tanks with it. I’m currently lining the inside of a new XR400 frame to combat the corrosion problem they have and I’m expecting the same fantastic results! Works great to fix old tanks. Used it on several different older bikes. A friend used it on a small steel honda tank. My tank is over 6gal. I ordered two kits. The problem is there isn't enough acid for a large or small tank. The sealer is great. I had to go to the hdw store, bought two gallons of acid. Which was more than the kits. Just to get the rust out. Just like I was told. But I had already made my order. 79 Honda CBX six cylinder 1050cc. Used this on my rusted out 300ex gas tank. It fixed it good as new. much cheaper than buying a new tank. good stuff! BEST ANSWER: I think it will work. The liner is pretty thick and should fill the hoes. You might try filling the ibigger ones with a tiny bit of epoxy. Dob it on the bigger holes with a toothpick so it doesn’t get everywhere. After it dries use the liner. It really works great!